While visiting Denmark this summer I went to Den Gamle By in Arhus where there was a travel poster display. “Genkendelsens Glæde” is a collection of classic Danish posters from the 20s-90s. When we walked unknowingly into the exhibition hall I heard my sister say “Uh, oh, we’re going to be here forever…”. I only wish. Below is one of the better pictures I could take, and also a good summation of my childhood memories of this tiny country. 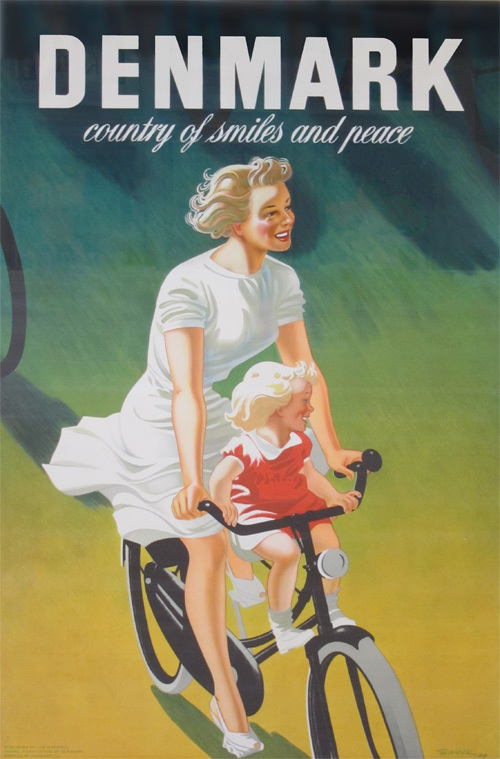 The Danish Poster Museum has a partial digital archive of the collection, as well as some reproductions of various posters in large format postcards that are for sale. Awesome. That’s how my daughter rides, in Portland. Just like your poster, come to life. Smiling, wise beyond her age. Though I can’t get my wife in those tunic dress thingies, got to work on that. This is, what is that phrase, um det er totalt fantastiske…I want one. I’m about to go buy one. Tak for posten!